Below we present to you a basic arm training, using equipment available at home or in a gym. Let’s start with pullups. They can be performed almost anywhere, on a bar, a door frame, a tree branch or any piece of horizontal pipe. In any case you will work your arms, which is good. We want to show to you some specific armwrestling exercises. Beginners should perform pullups at full range, as this engages the most muscle groups, and full-range movement strengthens muscle fibers in their whole length. If you’re serious about armwrestling, that you should find a bar thicker than a standard. 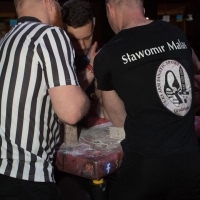 A thicker bar allows for better engagement of fingers and palms, and we all know this is essential in armwrestling. For those who are only beginning, we recommend doing the exercises below at full-range for some 2 months. This will allow to strengthen the most muscle groups, which is optimum for armwrestling. Bar training should be performed two times a week, for beginners. After a short, full-body warmup, perform each exercise in 3-4 sets, with reps depending on individual strength and stamina. A preferable number of reps is between 4 – 10. If , after two months time, we can do more than 10 pullups per set, we should proceed to more advanced training. Overgrip pullups – full range of movement. For beginners, grip at shoulder width. More experienced fighters might grip wider, to engage more back muscles. Undergrip pullups - full range of movement. Change of grip targets biceps more. Proper hand placement for undergrip pullups. Hammer grip pullups with parallel bars - full range of movement. Placing thumbs in front of bar causes more strain in fingers and strengthens them in result. For proper execution, for both beginners and advanced fighters, we suggest a chest – width grip. Overgrip corner pullups - full range of movement. Modified grip allows for more muscle groups engagament. Below we present an exercise for those who worked out systematically in phase one (2 months). The difference here is that we pull up to 90 degrees in relation to bar. This strengthens the angle between arm and forearm, necessary in armwrestling. This is the closest movement to actual fighting moves. Bar training for the advanced fighter should be performed once a week. After general warmup, perform pullups to 90 degrees, with overgip, parallel bar overgrip and corner overgrip. Perform 2-3 sets of every exercise. With 15-20 reps. After that, perform one set of every exercise with weighted belt. Choose weights to perform 4 – 6 reps. Advanced practitioners proceed to further exercises after bar workout. Overgrip pullups – from 90 degrees angle. Hammer grip pullups on parallel bars - from 90 degrees angle. Overgrip pullups on corner – from 90 degrees angle. Proper weights affixing for bar pullups. For safety, we recommend using proper weightlifting belts, as improvised solutions might lead to various injuries. All the above exercises have great effects, but early use of this training regime guarantees quicker progress.